In Japan, NHK did not show any news on thyroid cancer on NHK evening 7 News or NHK evening 9 News on August 21, though the press conference was held at early evening on the day. Only broadcast was made on NHK morning 7 on the following day, which mentioned the "Experts' denial to determine that the thyrid cancer was increased by the accident"
Also, very shrewedly, NHK said in the morning 7 news, "6 additional thyroid cancer children were confirmed (probably compared to the May 27th data, however, NHK HAS ALMOST NEVER BROADCASTED ANY THYROID CANCER FUKUSHIMA KIDS!)" Here is the transcript of the video above. Health professionals in North Eastern Japan are suspicious aobut the trend they are seeing after the nuclear accident there 2 years ago. The normal incidence rate of thyroid cancer in children is one in hundreds of thousands, but 18 children in Fukushima prefecture have been diagnosed as thyroid cancer among 2 million population. Health professionals have been examining 360,000 children aged 18 or younger at the time of the accident at Fukushima Daiichi. Radioactive substances released by the accident can accumulate in children's thyroid glands, possibly increase the risk of developing cancer. Health professionals have tested 210,000 children by the end of July. On top of 18 children who have been diagnosed, 25 others may have the illness. The panel say that they cannot determine whether the accident affected the rate of cancer among children. They decided to set up a team to look into the situation. Thyroid cancer found in 18 Fukushima children http://www3.nhk.or.jp/nhkworld/english/news/20130821_06.html 20 Aug 13, Medical examinations in Fukushima Prefecture following the nuclear crisis of 2011 have detected 18 children with thyroid cancer. The finding was reported on Tuesday by a prefectural panel examining the impact of radiation on the health of local residents. The prefecture is giving medical checkups to all 360,000 children aged 18 or younger at the time of the accident at the Fukushima Daiichi plant in March 2011. That’s because radioactive substances released in the accident can accumulate in children’s thyroid glands, possibly increasing their risk of developing cancer. Some 210,000 children had been tested by the end of July. Besides the 18 minors diagnosed with cancer, 25 others are suspected to have the illness. The incidence rate of thyroid cancer in children is said to be one in hundreds of thousands. In Japan, 46 people under 20 were diagnosed with thyroid cancer in 2006.The panel says it cannot determine if the accident has affected the incidence of cancer among children in Fukushima. But it has decided to set up an expert team to look into the situation. Panel chief Hokuto Hoshi says they will carefully examine the accumulated data and individual cases so they can give explanations to residents in a responsible manner. 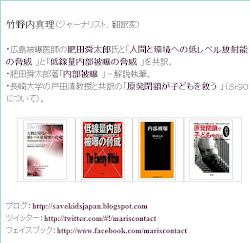 Donations wanted for anti-nuke/anti-radiation exposure activities by Save Kids Japan !